Lately, I have become increasingly interested in eating locally produced foods, something that is a bit difficult when you live in the middle of the desert. I have been to a few farmers’ markets in town, and have walked away disappointed that most of the items for sale were crafts, fair-type food (hot dogs, lemonade, cotton candy), and produce from California. I love the website www.localharvest.org, where one can search for CSAs, farmers’ markets, and pick-your-own farms by geographic location. This morning my parents and I checked out Gilcrease Orchard, located in northwest Las Vegas, just about 5 minutes drive off the US-95. 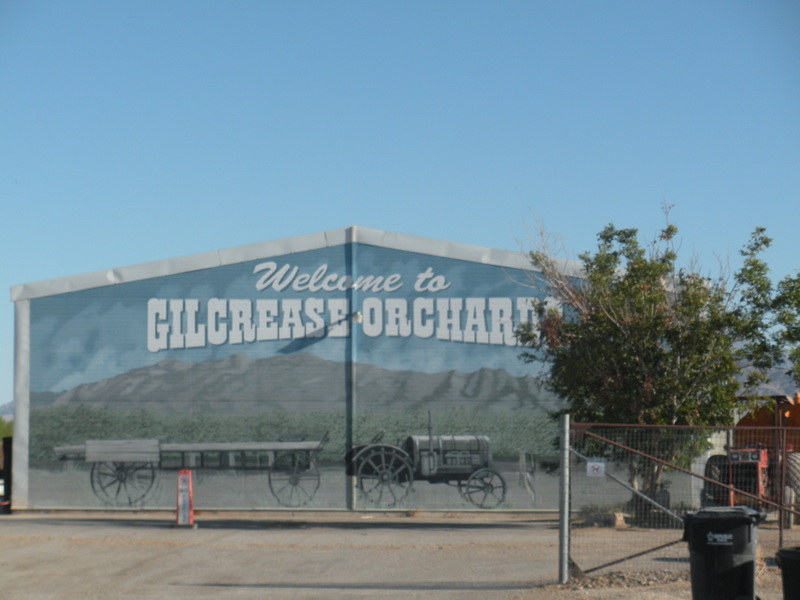 According to the brochure I picked up at the entrance, the Gilcrease Ranch was built in 1920 and the orchard established in 1977. The Gilcrease Orchard Foundation has been a registered non-profit since 1996, with a major focus on providing the community an opportunity to learn about agriculture. Area schools can arrange field trips to the historic site, and the orchard is open to the public Tuesdays, Thursdays, and Saturdays from 7 a.m. to noon for visitors to pick-their-own produce. From their website, you can sign up for a weekly e-mail newsletter for a summary of the produce that’s ripe for picking that week. Alternatively, a sign at their entrance lists the pickable produce as well. You can park across the street and walk in, or drive your car inside for $3. My mom and I walked around the orchard, and only put in about 1 mile. However, if you plan to get loads of produce, paying the $3 to bring your car inside would be worth it. Note that only cash is accepted for all purchases, and most produce costs $1 per pound. 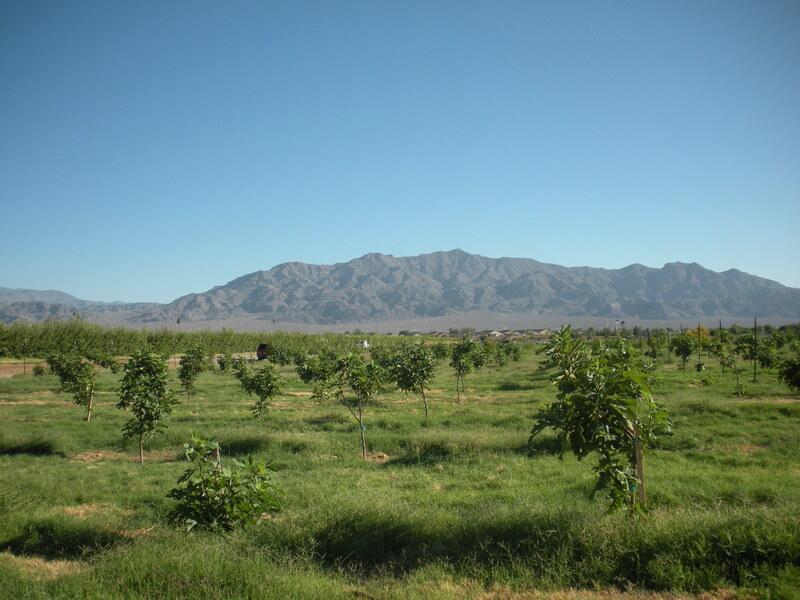 Rows of fruits and veggies are labelled with signs, and the flagging at the ends of the apple orchards indicated which apples were ripe. In October, visitors can venture into their popular pumpkin patch and select their own jack-o-lanterns. Another popular pick for families is their delicious apple cider, available year-round at the checkout stand. In large quantities this week were apples, pears, cantaloupe, watermelon, cucumbers, zucchini, tomatillos, okra, eggplant and yellow squash. 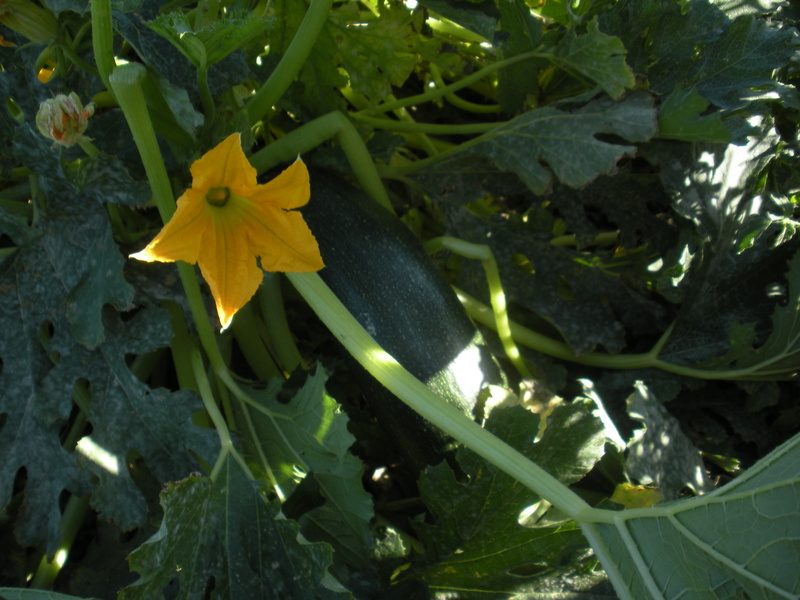 The zucchini plant, which seems to do incredibly well in southern Nevada, had produced an enormous yield, including some pretty huge squash. Zucchini bread anyone? Later in the fall, they will have acorn, spaghetti and butternut squash (my favorite! ), as well a sweet potatoes. I was also curious about the rows of Georgia peanuts that they had, but I have no idea when they mature. So for today, I settled on $17 of produce that will last my husband and I a week. Next week I plan to try my luck at another Las Vegas farmers’ market. 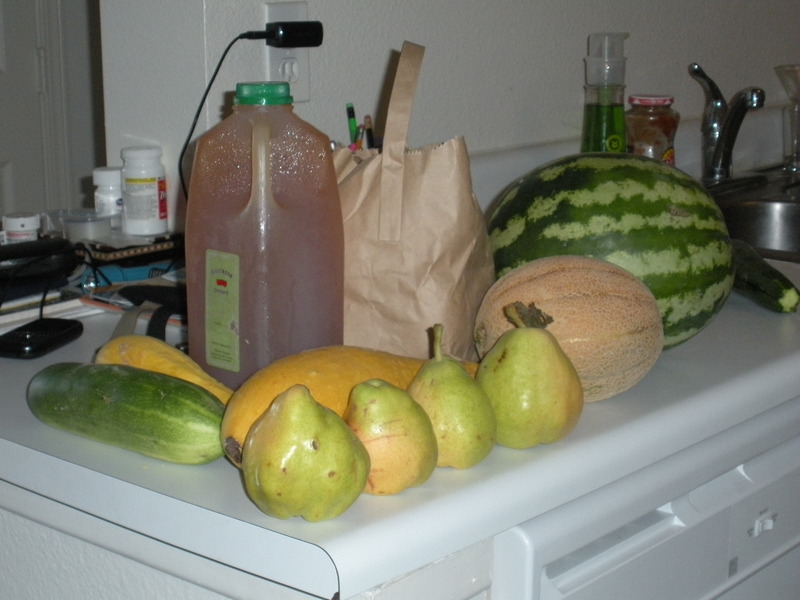 This entry was posted in Green Living, Healthy Living, Las Vegas, The Simple Living Experiment and tagged agriculture, community-supported agriculture, Las Vegas, local farms, pick-your-own, produce. Bookmark the permalink.